White House Retreat is pleased to announce our latest restoration and beautification project, the Ignatian Spirituality Trail. 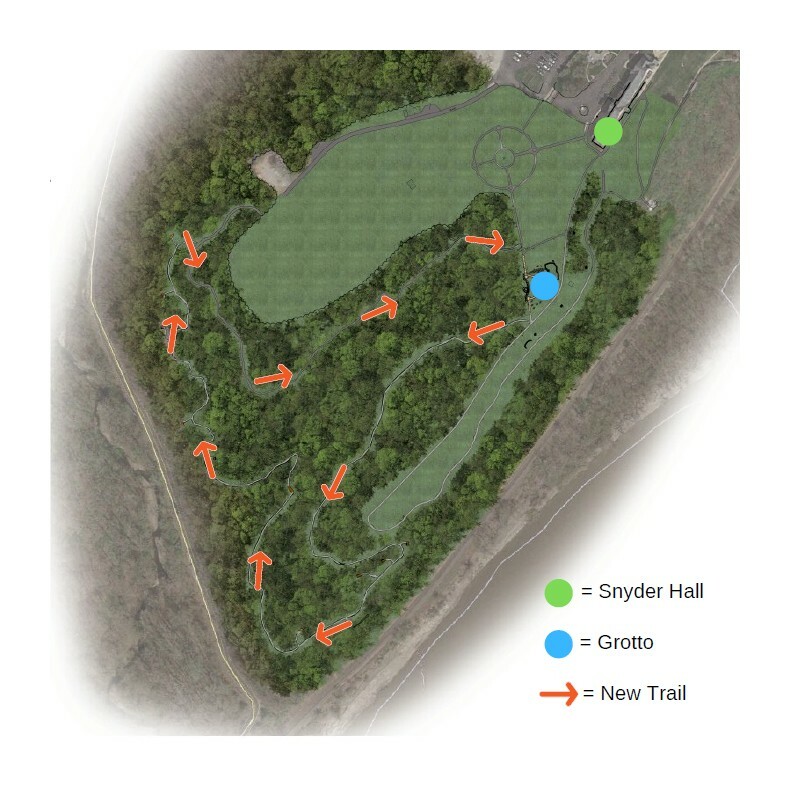 This walking trail will stretch almost one mile into our woods and will feature various markers that will teach visitors about the life of St. Ignatius of Loyola. As you know, more than half of our property is wooded and unseen by most retreatants. This trail will allow our guests to experience much more of our beautiful property and find even more places to encounter God. The new trail will begin and end at our Grotto. The Grotto is also included in this restoration project and will be the first area we will begin work on. Erosion over the years has taken its toll on this beautiful shrine and caused damage. Retaining walls and various landscaping upgrades will get underway soon to give this section of the property a beautiful update. If you are able, we are asking for donations toward this project in any amount. Your generosity will directly help us repair and rejuvenate our beloved Grotto and add this beautiful new walking trail. Artist renderings can be seen on the enclosed letter. To accelerate the development of this project we are offering people the opportunity to leave their mark on a legacy plaque in honor of a family member, friend or retreat group. We have two different options available. First, ten new permanent benches will be installed along the Ignatian Spirituality Trail and each bench includes a plaque that can be engraved. These are available at $5000 each. Second, each of the 10 stone markers along the path that explain the story of St. Ignatius will also have a plaque available for engraving. These markers are available at a cost of $10,000 each. To sponsor a bench or a stone marker, please call Joe Parisi at 314-416-6400. All donations toward this project are tax deductible and greatly appreciated. Our plan is to begin work on the Grotto later this spring and begin constructing the trail once we hit our initial fundraising target. Thank you for your continued support and generosity as we embark on this exciting new chapter at White House Retreat.